After our time in Omaha, we headed off to phase two of our summer travels – a few days in South Dakota! Since we don’t live near any of our extended families, most of our trips have been focused on traveling to see them, but especially as our kids get older, we want to make it a priority to show them more of the world, as well. 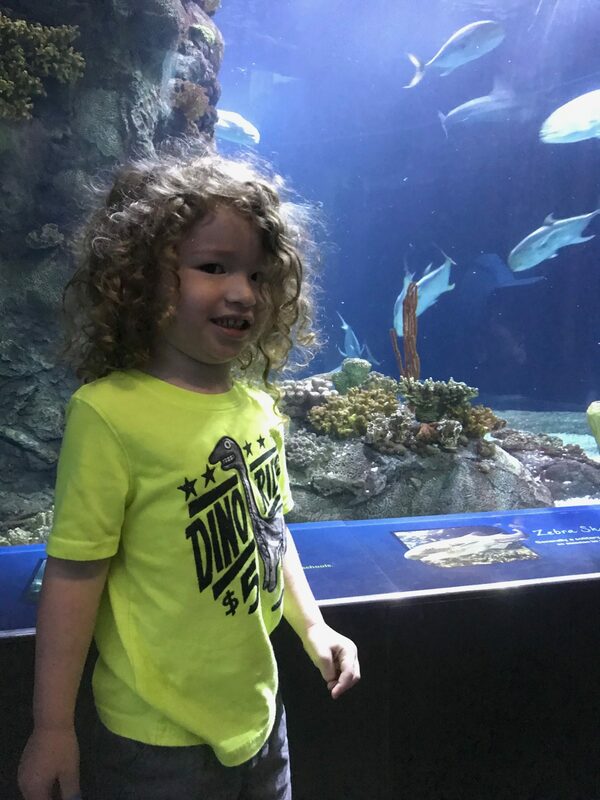 We thought that with the ages of our kids, a trip out to South Dakota could be a good fit – some tourist attractions and opportunities to learn about nature and history but no long days in museums (which would be heavenly for Matt and me and much less so for our children! ), and it was close enough that we wouldn’t have to drive forever to get there. We left Omaha on Saturday morning and drove out to Wall, South Dakota, where we were joined by my mom and brother David – it was so nice to get some time with them on this trip, too! After a night in the hotel, we got up and visited Wall Drug the next morning. 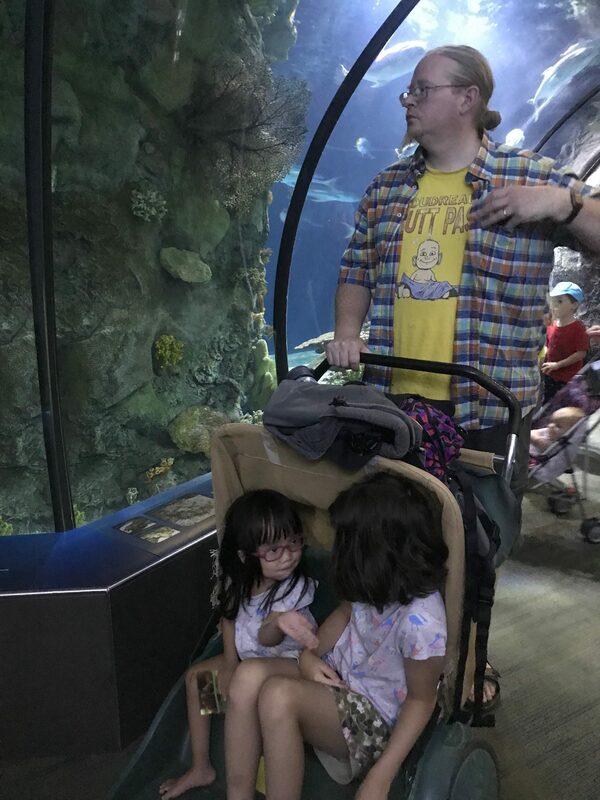 The kids actually did a great job of browsing and enjoying the experience without asking for 50,000 toys, and at the end we let them each choose one item that we’d buy for them. Then that afternoon we drove through the Badlands, which were beautiful beyond what I can describe. For the rest of our time in South Dakota, we’d arranged to stay at an AirBnB, which, we’ve discovered, is really what makes vacations work for our family. Spending days at a time in a standard hotel room is too overwhelming, but having more space and being able to prepare our own meals makes everything so much more manageable. The morning of our first day on the western edge of South Dakota was spent at its most well-known attraction – Mount Rushmore! The big kids and I will be starting to learn about American history this year, and this was a great introduction, giving us an opportunity to talk about some of the presidents and a bit about the history of our country. We’re hoping the rest of the country comes to its senses and joins her in that opinion soon, as well. We went from Mount Rushmore to Crazy Horse, which Matt had seen about 30 years ago but which the rest of us had never visited. It was fascinating to hear about its history and construction and the plans for its completion and to compare and contrast it to Mount Rushmore. There was a bus tour that allowed us to get close to the monument itself, and we were so glad we took advantage of that opportunity. The bus driver doubled as a tour guide and gave us more information and stories about Crazy Horse and its construction, and it was great to see a closer view of what was actually happening. Seeing a monument of this size being financed privately and in conjunction with efforts to support Native Americans was so impressive. The next day we drove out to Wyoming to see Devil’s Tower, something to which Matt had been looking forward for quite some time! The kids really loved it, too. Miranda and Atticus are enthusiastic climbers, and Miranda talked a lot about coming back to climb it someday (we saw several climbers while we were there! ), and she enjoyed any opportunity to climb on the boulders around the path we walked around the landmark…and I spent much of my day trying to keep Atticus safe while he attempted to follow her! The following day I got up early drove out to Rapid City (everything is so spread out in South Dakota!) to meet a friend for breakfast, one of my co-moderators in the Facebook parenting group I help to moderate. It was a joy to sit down with someone who just gets it, who parents a child who has lived through trauma and who subscribes to the same parenting philosophy Matt and I use in interacting with our kids. It was so nice to meet her and spend a few hours together! Our van’s brakes had been grinding, and it was in desperate need of an oil change, so after my breakfast date, I called around to local repair shops and sat around for a couple hours while our brake pads were replaced and oil changed – not super exciting but necessary. I didn’t get back to the rest of the family until around 2:00, which limited our afternoon options, but Matt and David researched some choices, and we ended up taking a scenic drive and getting out and walking around a bit. South Dakota is so beautiful! The next day it was time to head out, so we packed ourselves up and started the long drive back home. We had one more attraction to see along the way – the Corn Palace! And then after an overnight stop in Omaha on the way back, we made it home 🙂 Overall, it was a great family vacation time. There was some drama, but overall, the kids did really well with the driving time, and we really enjoyed our time as a family in South Dakota. It was so nice to have my mom and David there, too. The kids love hanging out with them, and though our night time adult hangouts were shorter than we would have liked, it was good to get even those little bits of time. We got to enjoy experiencing a new place together and talking about our country and its history. All in all, I’d say it was a successful vacation! Did you catch that title? “Omaha 2018.” No subtitle. 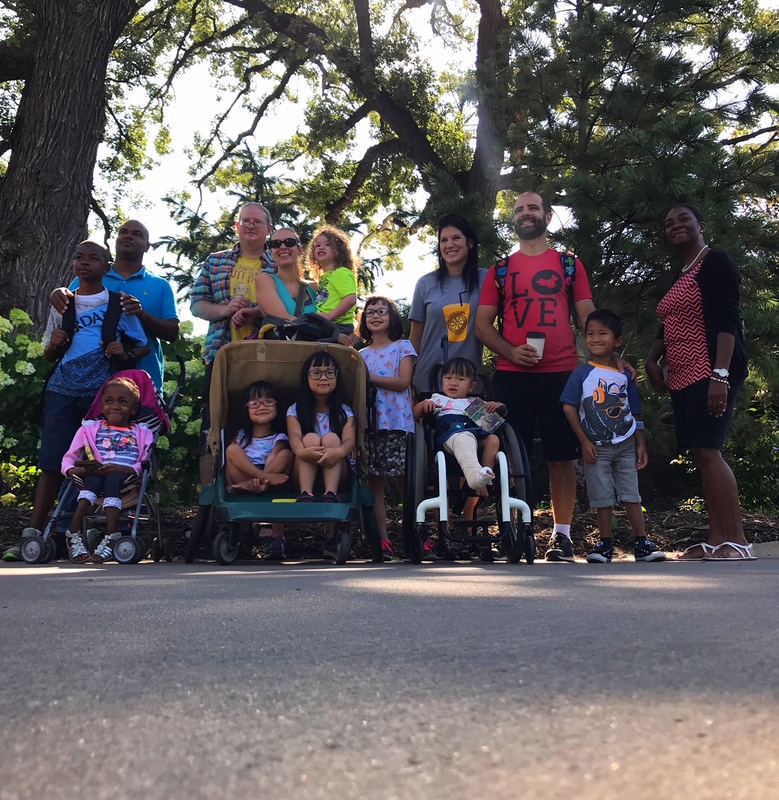 In contrast to our four trips to Omaha in 2017, my hope has been that this would be our one 2018 Omaha excursion – but I knew that would largely be determined by what we found out during this trip. About a week and a half ago, we loaded up our minivan and packed up our family of six and drove out to Omaha, where we were overdue for FangFang’s annual OI clinic visit. 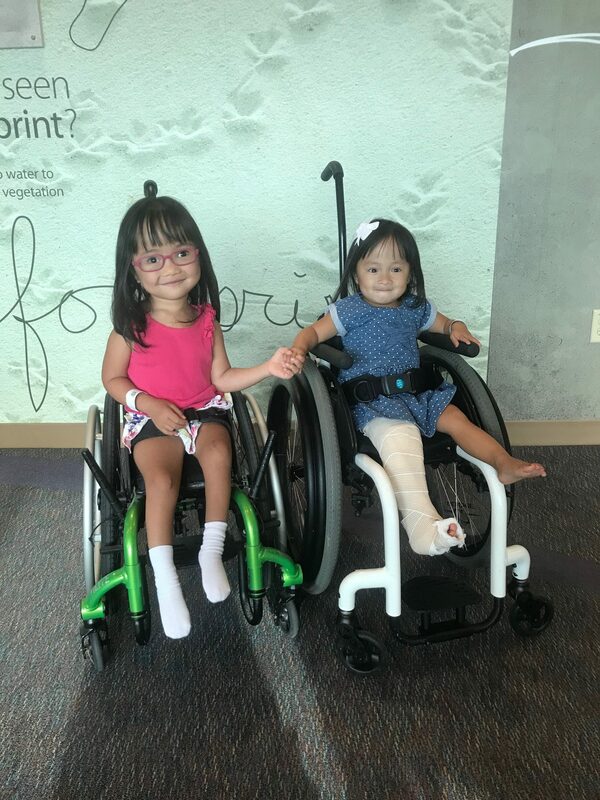 World-class practitioners in multiple specialties related to osteogenesis imperfecta (OI) work together in Omaha to provide a clinic experience that, to my knowledge, is unmatched. 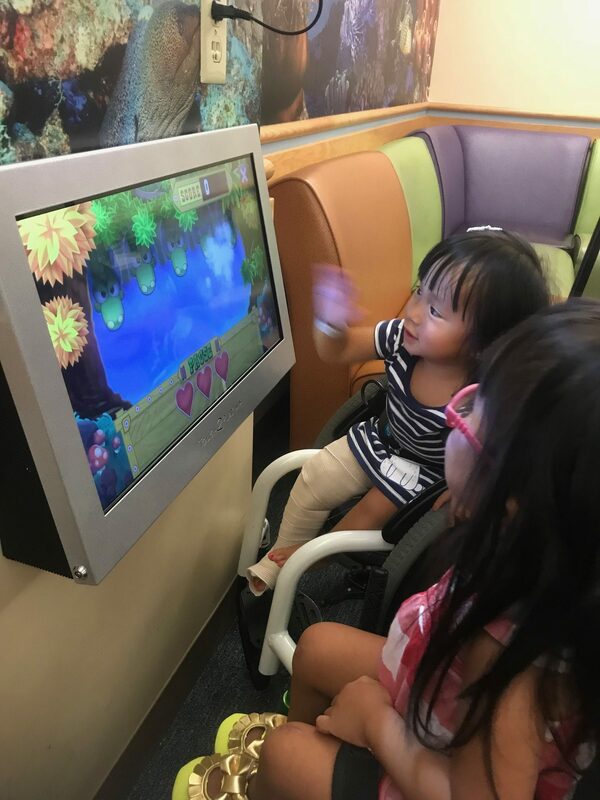 We arrived on Tuesday night, and FangFang and I headed to the hospital on Wednesday for the testing that would give us valuable information about her growth, her bones, and her body in general. This year was a light year in that all we needed to do was a dexa scan (which measures bone density) and a collection of x-rays (that check the status of the rods she currently has placed in both femurs, both tibias, and her left humerus; show us the status of her spine; and generally look at how her bones are growing and whether there have been significant effects from any recent fractures). The highlight of the day for us was seeing FangFang’s former foster sister, Xiao, whom she knew in China before we ever met her. Our families have stayed in touch since the girls have come home, and we hope to continue to be able to schedule their clinic visits together and maintain this relationship for them. Our children from China have so little from their pasts – these connections that we can help them keep are so special. And in each other, they each have a friend who truly understands, who is living life as a Chinese adoptee with OI. Those connections will likely be invaluable to them as they grow and begin to negotiate the world with increasing independence. We’d actually hoped the reunion would be even larger. There is a third sweetheart, Gabby, who lived at the same foster home as FangFang and Xiao in China, and she recently came home and was scheduled for her first clinic appointment at the same time as us – but unfortunately, her older sister (also from China, also with OI) broke her femur the week before clinic, and their family was unable to travel ☹ That was such a bummer – we’d been so looking forward to seeing all of them! 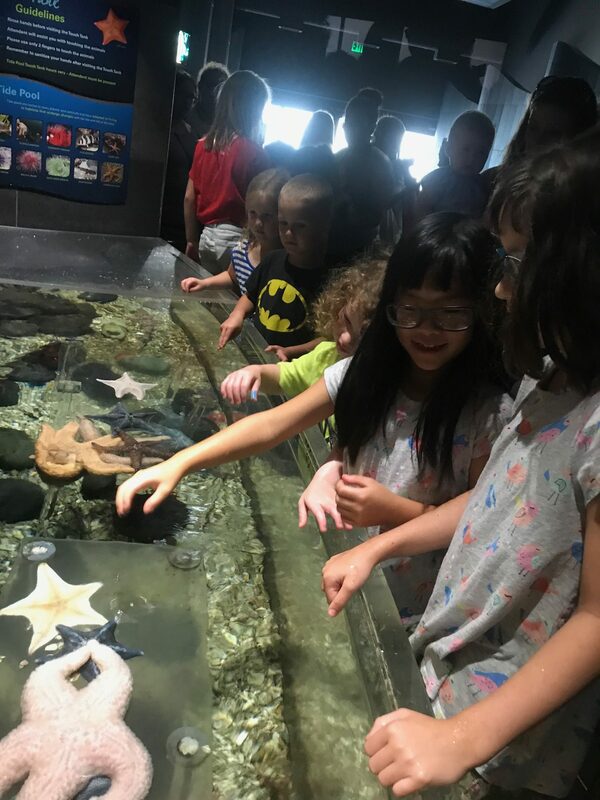 There are a few other families with kiddos from China who have OI with whom we hope to continue to maintain connections, as well. 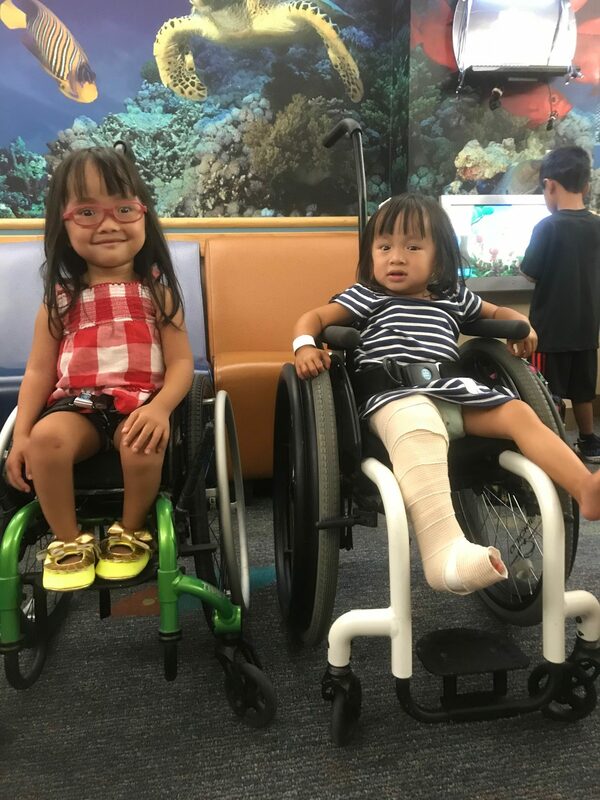 We’re so thankful for these sweet moments between Xiao and FangFang – even at 3 and 4, they delighted in seeing another child like them, using a wheelchair, having scars from rodding surgeries, occasionally sporting a splint – we’re going to do all we can to continue to facilitate these connections for our kiddos! 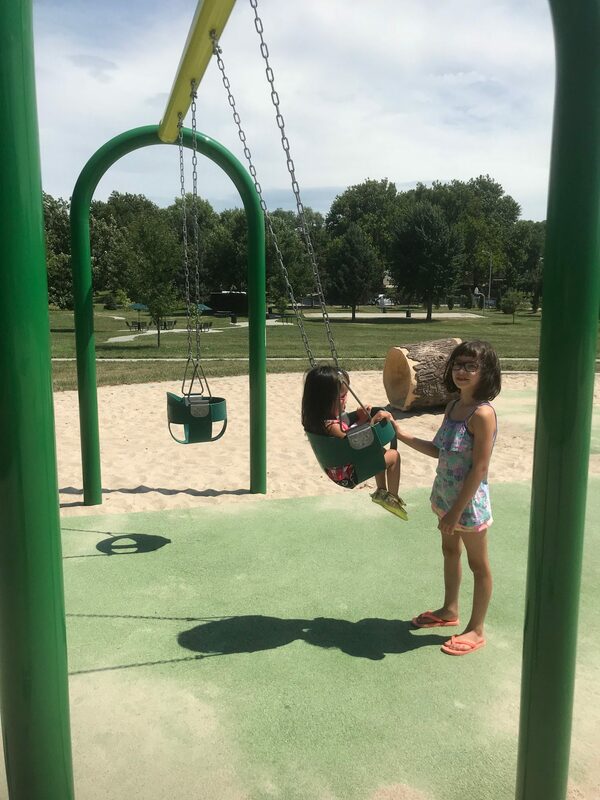 While FangFang and I did that testing, Matt took our other kids to a park, and once we were done, they came back for us and we all spent the rest of the afternoon playing at the park. In an attempt at frugality, I’d booked all six of us in a standard hotel room for our time in Omaha. While it was certainly frugal, it was also rather miserable. We were all on top of each other all the time, the kids had no room to run around or play, and it was just generally an unpleasant situation. We ended up spending most of the waking hours during which we were at the hotel letting the kids watch tv, because it was our best strategy to keep the peace. And now we know. We can certainly handle standard hotel rooms for a one night stop or something of that sort, but for any extended stay, it is unwise! FangFang and I were at the hospital by 7:45, and we got to chat a bit more with Xiao and her family before clinic started. 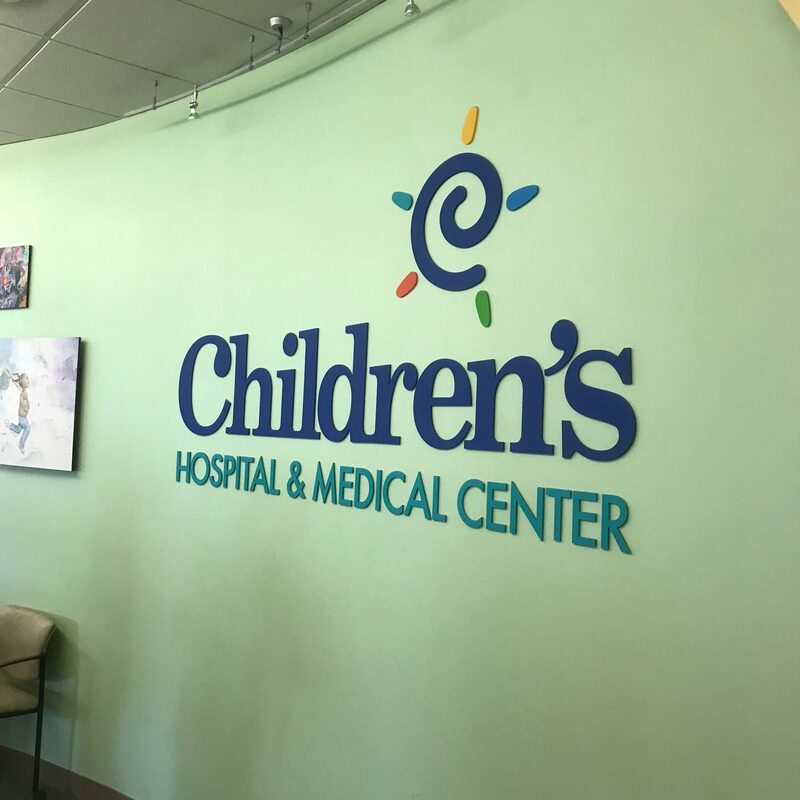 After a nurse got FangFang’s height and weight, we were taken to a room that would be our base of operations for the rest of the morning while doctors and other providers rotated around to talk with us about their individual areas of expertise as they related to FangFang. First up, we saw Dr. Esposito and Dr. Wallace, the orthopedic surgeons. I knew that their assessment of how her bones and the rods she’s had inserted into many of them (both femurs, both tibias, and her right humerus) would largely determine whether we needed to make a planned return trip to Omaha any time this year – and, thankfully, they don’t believe that will be necessary! 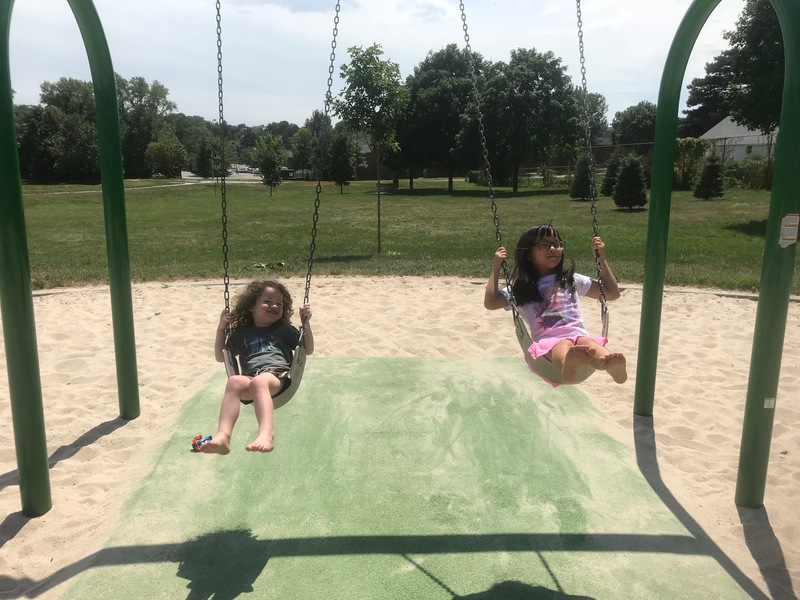 Of course, we may end up back there anyway – a significant fracture requiring surgery would mean a drive to Omaha for Dr. Esposito and Dr. Wallace to operate – but we at least don’t need to plan anything now! Her left femur rod is the one they have the most concern about. It was the earliest placed, and the surgery was done in China, and it will likely be the first to require revision, but they said that as long as she isn’t experiencing pain or limping, we should leave it alone. 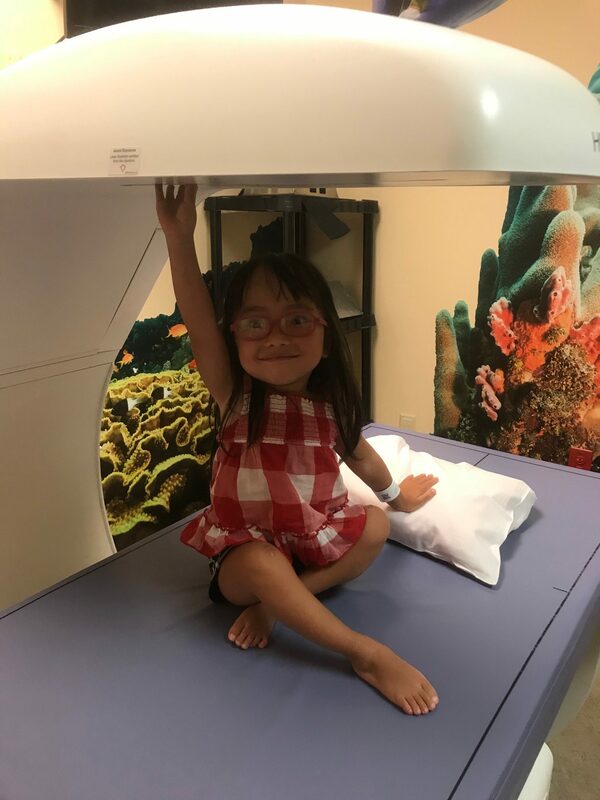 We looked at her spine, and her scoliosis is not particularly severe, and the wedging we can see on x-rays has improved in the last year, largely due to the Pamidronate treatments she receives. Essentially, everything looks pretty good from an orthopedic perspective! We also met with a researcher for a 5-year longitudinal study being done out of Omaha, in conjunction with other research sites, collecting data about individuals with OI to use in research studies, and we’ll have FangFang start participating next year. There is not a great deal of research available related to OI, and we want to do anything we can to be part of developing that, hoping for more and better treatments in the future. The endocrinology team was very happy with the improvements in FangFang’s bone density shown by the Dexa scan. It’s actually a bit confusing, knowing what the level of improvement was – there is a discrepancy between what the 2017 report shows as her 2017 measurements and what the 2018 report shows as her 2017 measurements, and no one was quite sure why. But, regardless, her 2018 numbers show either a 15% or a 30-40% increase over her 2017 numbers, so we’ll continue with her same level of Pamidronate treatment. We also saw a dentist and a dietician. The dentist continues to see no OI-related issues with FangFang’s teeth, which is great news. And the dietician talked with me about our diet and what FangFang eats and what her growth trajectory looks like, and she was happy with all that we’re doing, so no changes needed there. The physical therapist was also very pleased with what FangFang is doing and what we’re working on with our local physical therapist, which was great news! The occupational therapist recommended an OT evaluation and maybe 4-6 sessions of OT at home to work on underlying core strength and skills – grip strength, endurance, screwing and unscrewing. I’m not thrilled to add likely another appointment to our weekly routines, but it’s definitely a good idea to address these things as early as possible, so we’ll see what we can do! Overall I was very encouraged by the clinic visit, knowing that the Pamidronate treatments are having the desired effect, that her bone density is increasing, and that we likely don’t need to return to Omaha until next year for clinic. That’s pretty much the best report we could hope for! After clinic, Matt took the younger 3 kids back out to play at a park while Miranda and I stayed back at the hotel room. She did some math and some art while I put in a couple hours of work and then napped. Another consequence of that whole six people in one hotel room arrangement was that no one was getting great sleep! Friday was a really good day. We’d planned to meet Xiao’s family at the zoo, just to hang out and have fun, and that we did! Another family in town for OI clinic joined us, as well, which was great! They’d traveled all the way from the Bahamas for clinic, making our 5-hour drive look like nothing! 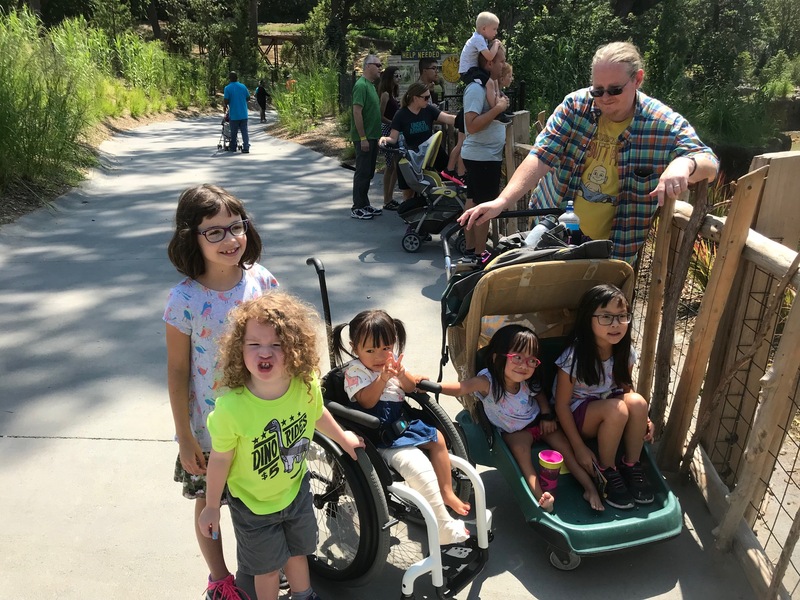 The kids loved running around and the zoo, and we’d heard great things about the it, and it did not disappoint. It was great to have this time to consult with these amazing OI-care experts and so good to connect with other families with kiddos who have OI. We were so thankful for our time in Omaha!